Moisturizing deep conditioner with keratin proteins for dry, damaged and chemically treated hair. This hair mask can be used daily as your regular conditioner or on a weekly basis as a deep conditioning mask treatment. 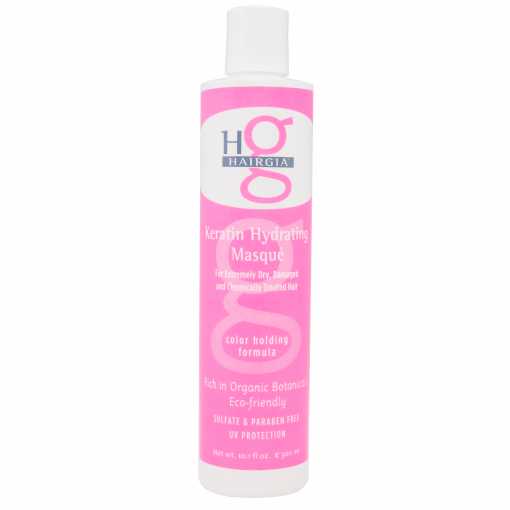 One of our most popular products, the Keratin Hydrating Masque provides remarkable hydration to dry, stressed, chemically treated hair. 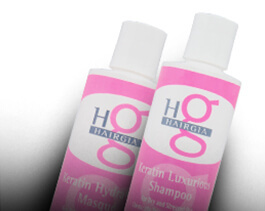 Keratin protein rebuilds the hair follicle, adding strength and shine. You can use it as a daily hair conditioner or use weekly as a deep conditioning mask. Many people find that their hair dries more quickly and with less frizz than it did before using the Keratin Masque! We suggest pairing it with our Keratin Luxurious Shampoo for best results. DIRECTIONS: Apply desired amount of Keratin Hydrating Masque to wet hair after shampooing. Massage gently into hair and scalp, and leave in for 2-3 minutes. Rinse well and repeat if necessary. For ultimate shine, apply our Polish Drops to damp or dry hair and then set your finished hairstyle with our Creative Mist hairspray. Your hair deserves the best. That is why we are dedicated to producing only the highest quality hair products made with the best natural botanicals nature has to offer. Our products are sulfate-free and we never test on animals. In fact, we personally test each and every product to make sure that we are creating hair care products that produce the very best results. 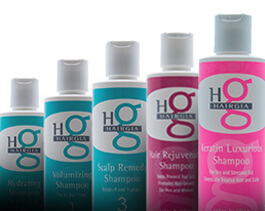 Family owned and operated, HairGia is committed to producing products that you and your family can be proud to use. Please don’t hesitate to contact us if you have any comments or questions. Love this conditioner it is a moisturizing life saver on curly hair! It makes your hair so soft and the smell is to die for!! Instantly repairs my fried hair after I bleach it! I have spent so much money on products that doesn’t work. I was recommended this product at Wilshire Beauty Supply in LA and I was a bit skeptical since nothing has been satisfying before. I was amazed of how great this masque was! There is few product that I swear by and this is one! Great fragrance, amazing soft silky hair and all natural! The bottle lasts forever too. I highly recommend this product! Best hydrating conditioner ever! It doesn’t weight your hair down but provides enough moisture and smooths the frizziness. I love the scent too! Only downside is not enough places carry this product!